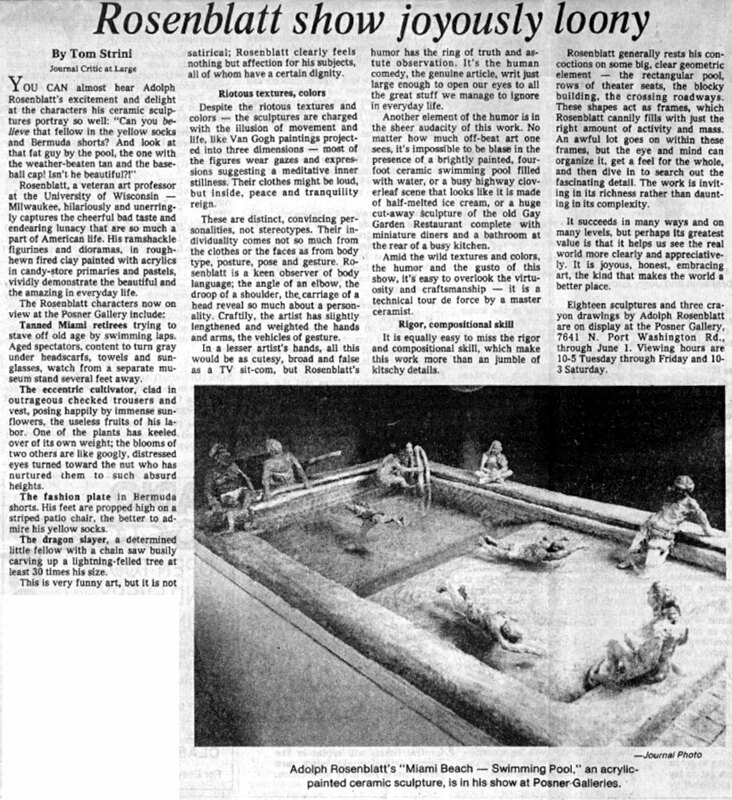 The reviews and reproductions below, from a wide range of publications between 1978 and 1996, were not available on the web until presented here. Click the thumbnail images to view a larger image or more detail. Use your browser's back button to return to this page. 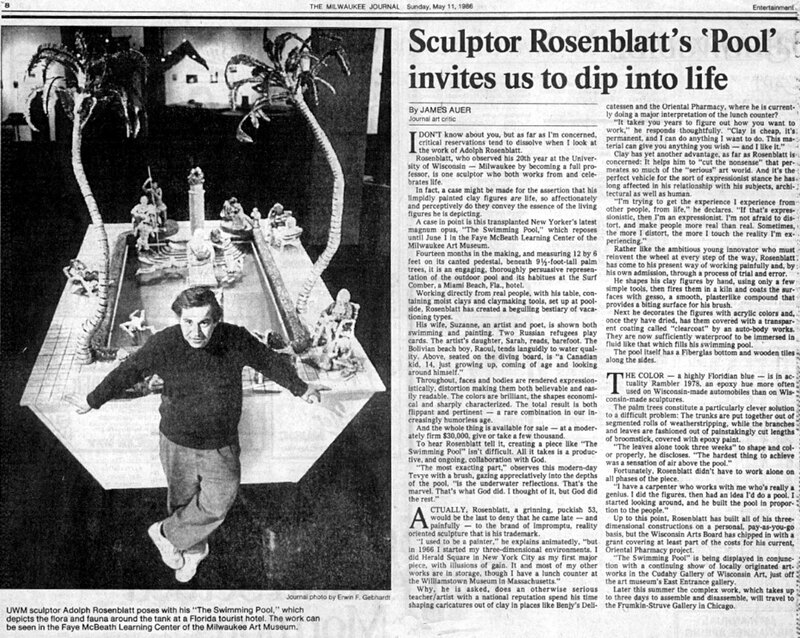 "If you're a friend of sculptor Adolph Rosenblatt, chances are you're looking forward with extra special excitement -- not to mention a touch of anxiety -- to the opening of his latest solo exhibit..."
"Blood is thicker than water. Oil and water don't mix. Two truisms with a single focus: the family. 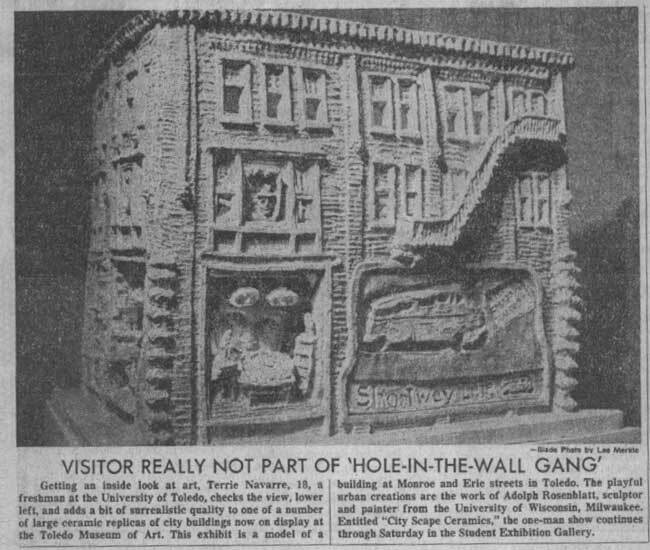 And never more applicable than when two members of the same family make art..."
Features a photo of Adolph's sculpture of painter Joseph Friebert and Eli's Hotel Room. 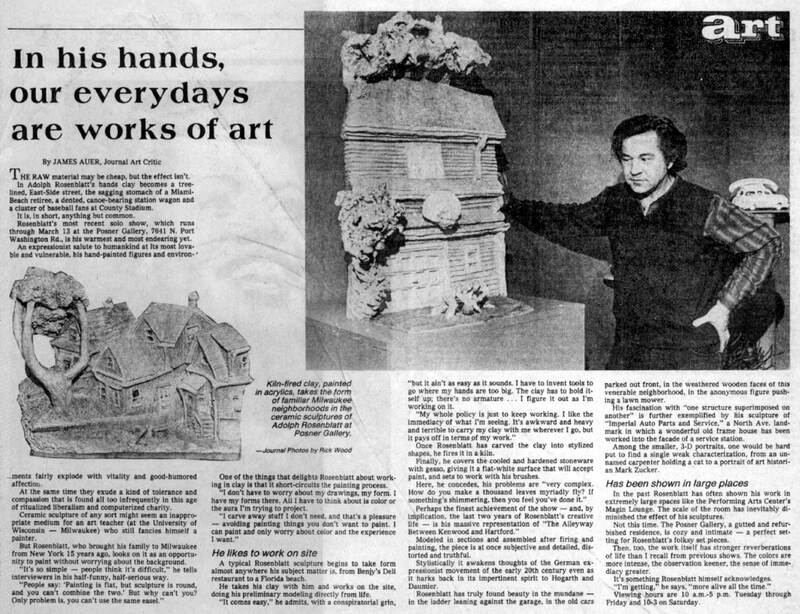 Striking Rosenblatt retrospective give us a new look at Milwaukee On Art by James Auer, Milwaukee Journal Sentinel, Wednesday, November 13, 1996. "No matter how many times I interview Adolph Rosenblatt, I always learn something new about him. 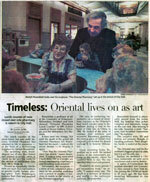 This time it's the fact that he was, at Yale, a student of the legendary German color theoretician Josef Albers..."
Timeless: Oriental lives on as art by James Auer, Journal Sentinel art critic, Milwaukee Journal Sentinel, Sunday, November 5, 1995. 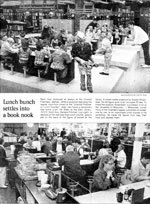 "The lunch counter of the much-loved, but now sadly defunct, Oriental Pharmacy has returned to life in miniature -- in the form of a 30-foot-long sculpture..."
Art galleries beckon on a cold day by James Auer, art critic, Milwaukee Journal Sentinel. 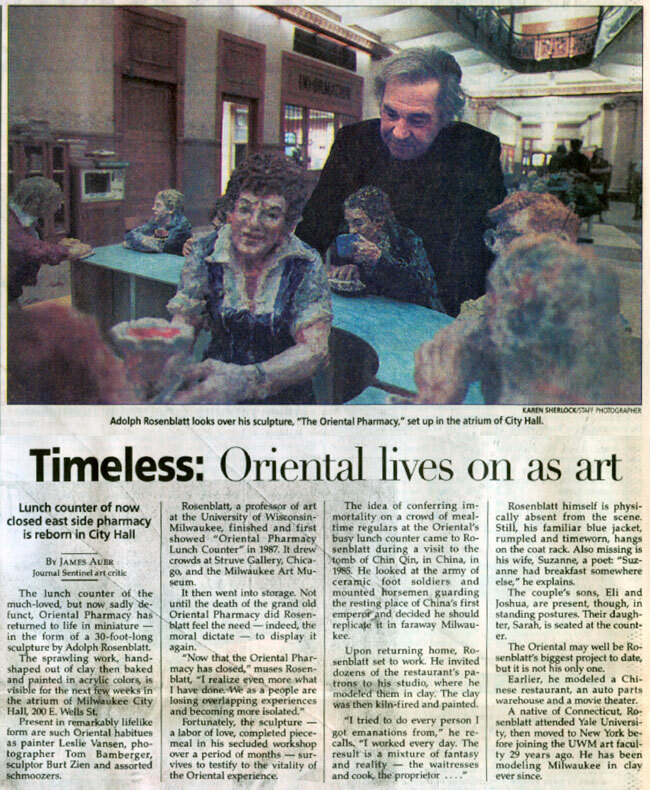 "The cozy camaraderie of the Oriental Pharmacy, now only a memory, is preserved by Milwaukee artist Adolph Rosenblatt in a vast sculpture of the pharmacy's lunch counter. The piece, containing 50 figures, can be seen in the atrium of Milwaukee's City Hall." 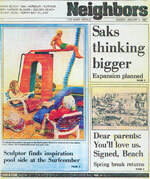 "Adolph Rosenblatt is a 'non-cutsey' sculptor who colors his rough-textured works like a painter. 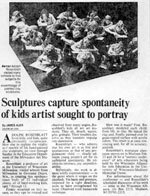 And hid fired-clay renditions of 22 area school children nicely illustrate his offbeat aesthetic approach..."
Includes interviews with Adolph and some of the children plus an announcement of the opening of the "We Are All Making Art" show at the Anderson Arts Center, 121 66th Street on July 15, 1995. 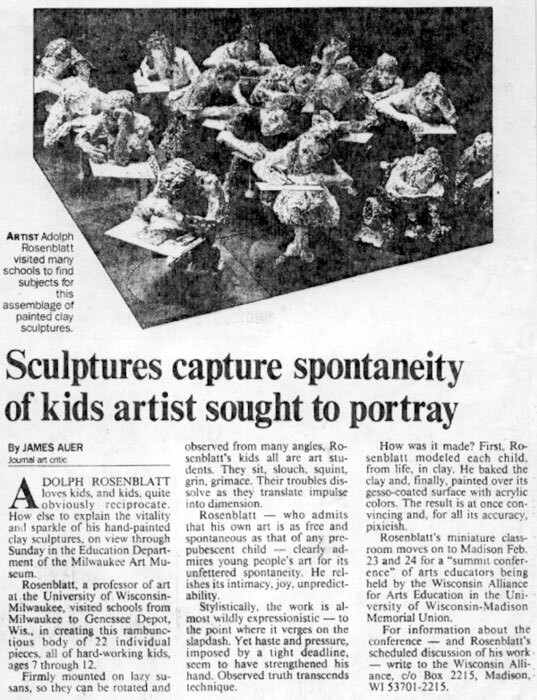 Sculptures capture spontaneity of kids artist sought to portray by James Auer, Journal art critic, The Milwaukee Journal, Tuesday, February 14, 1995. 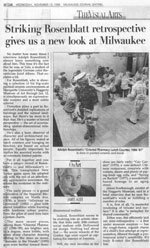 "Adolph Rosenblatt loves kids, and kids, quite obviously reciprocate. 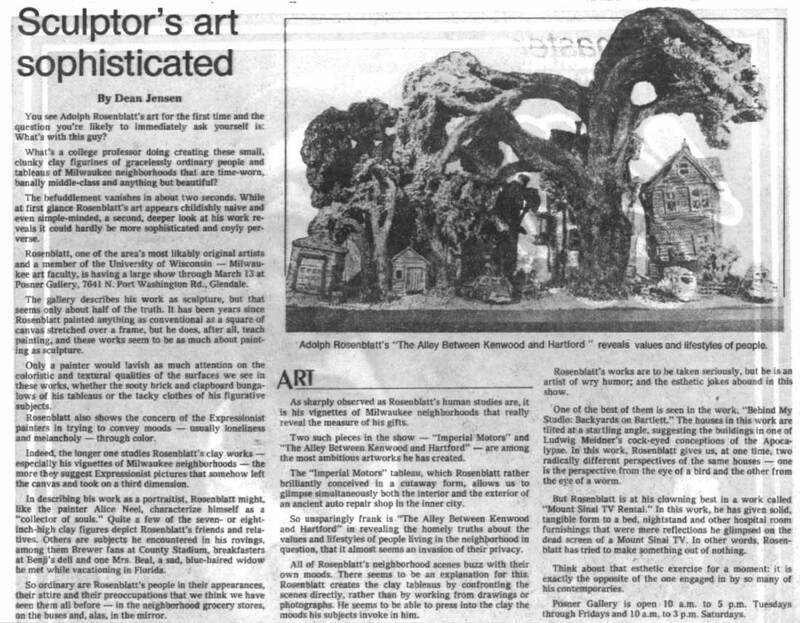 How else to explain the vitality and sparkle of his hand-painted clay sculptures..."
ALL FIVE OF US: The Rosenblatt Family by James Slauson, Art Muscle, 1993. 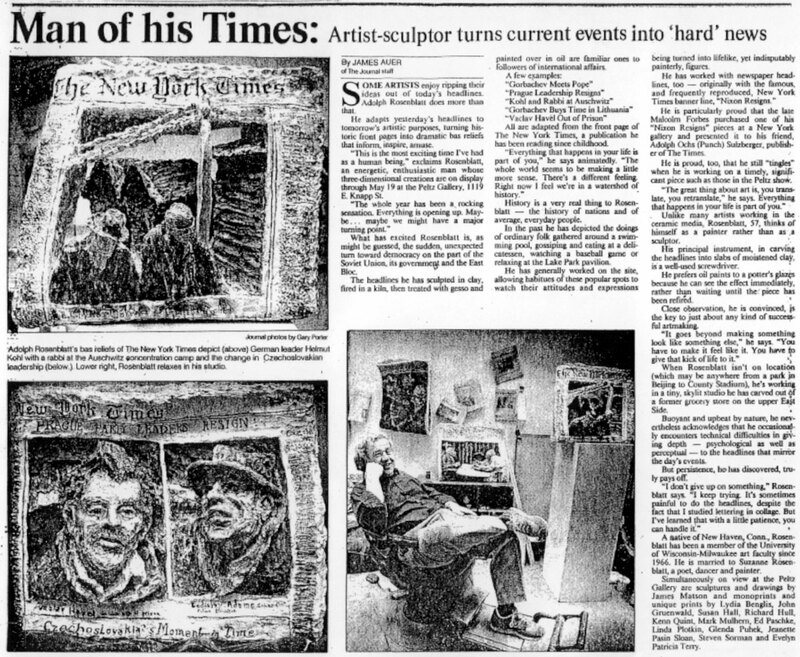 "This exhibition presented Adolph and Suzanne Rosenblatt's recognizable innovations, together with some current work of their offspring..."
Man of his Times: Artist-sculptor turns current events into 'hard' news by James Auer of The Journal staff. 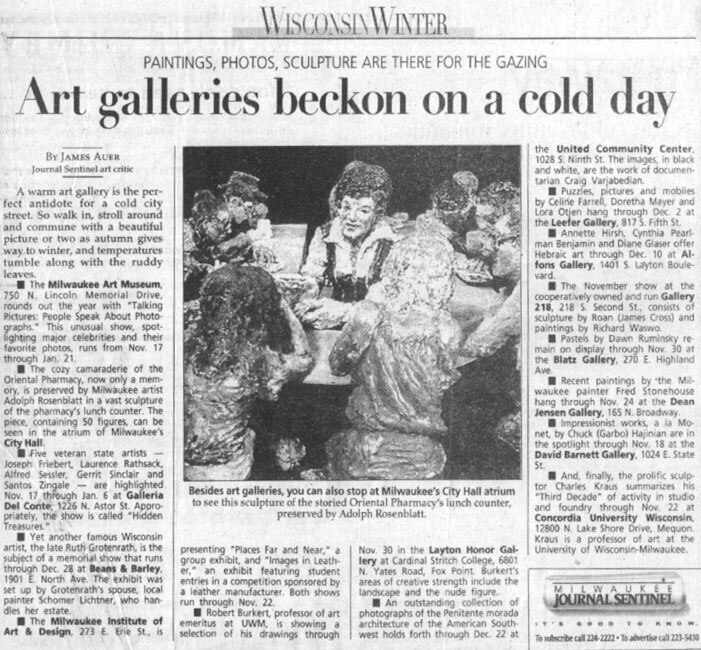 Around The Town, The Milwaukee Journal, Friday April 26, 1991. 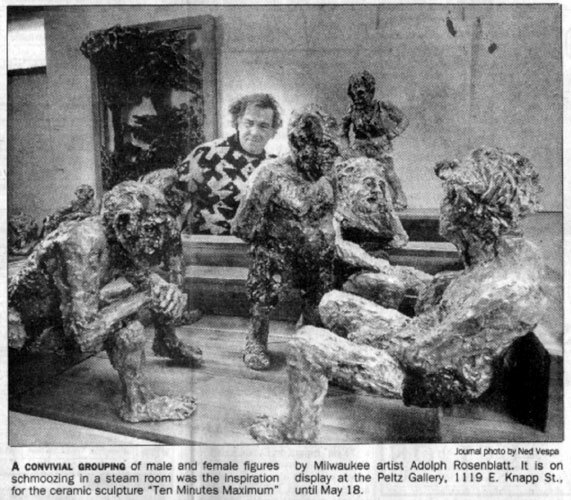 "A CONVIVIAL GROUPING of male and female figures schmoozing in a steam room was the inspiration for the ceramic sculpture "Ten Minutes Maximum" by Milwaukee artist Adolph Rosenblatt. 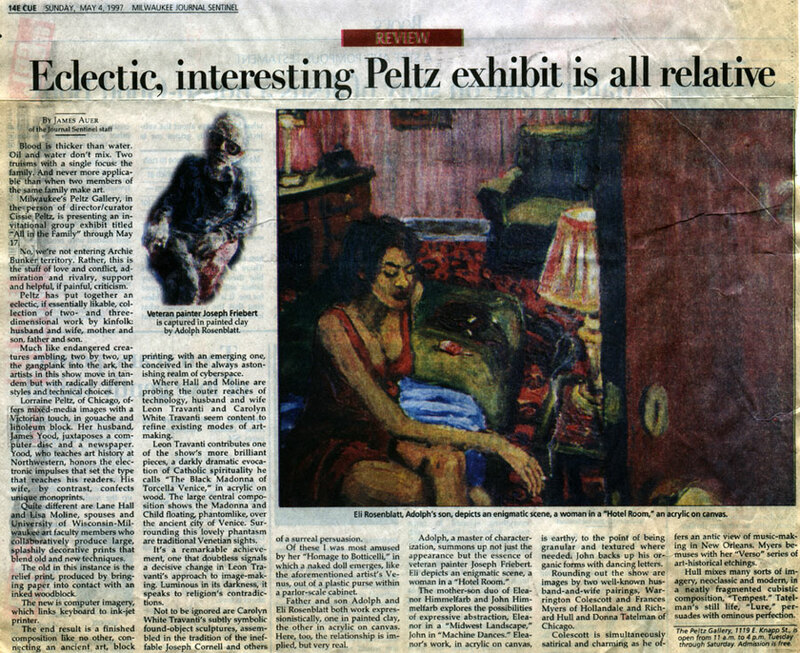 It is on display at the Peltz Gallery, 1119 E. Knapp St., until May 18." 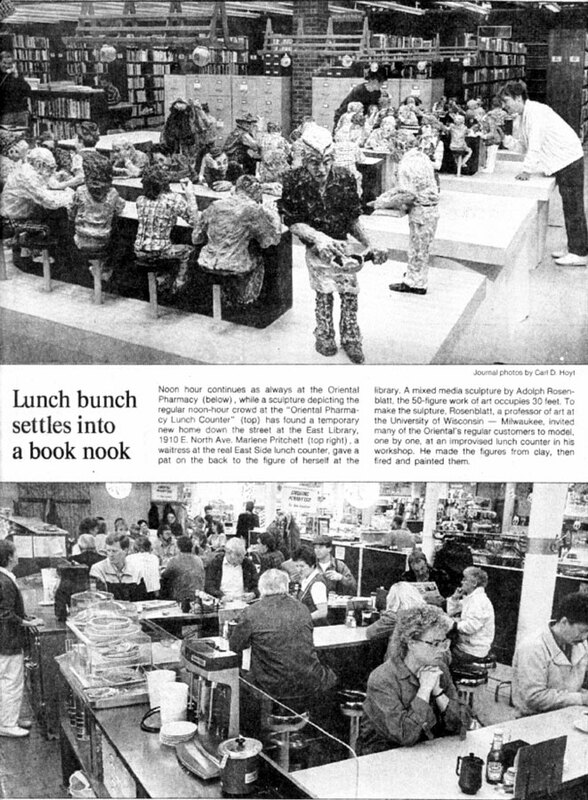 "Noon hour continues as always at the Oriental Pharmacy (below) while a sculpture depicting the regular noon-hour crowd at the "Oriental Pharmacy Lunch Counter" (top) has found a temporary new home at the East Library, 1910 E. North Ave. Marlene Pritchett (top right), a waitress at the real East Side lunch counter, gave a pat on the back to the figure of herself at the library..."
"Mechanical contractor-turned-sculptor Burt Zein is there, musing over a cup of coffee, and so is bookseller David Lenz. Painters Leslie Vansen, Maria Huppert and Joan Toman trade thoughts in pantomime as photographer/writer Tom Bamberger, wearing a broad-brimmed hat, silently plots his moves for the day. A waitress wipes away a greasy spot on the counter. A nurse from Mount Sinai Hospital rubs spiritual shoulders with a physician. A pregnant woman, a pretty child on her lap, adds yet another personality -- vital but unborn -- to the bustling scene..."
"Each year, drawn to Miami Beach as he is by the tides of family reunion, Adolph Rosenblatt lays out his dental tools by a garbage can at the Surfcomber Hotel pool..."
UWM sculptor Adolph Rosenblatt poses with his "The Swimming Pool," which depicts the flora and fauna aound the tank at a Florida tourist hotel. The work can be seen in the Faye McBeath Learning Center of the Milwaukee Art Museum. 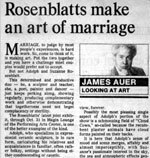 Rosenblatts make an art of marriage by James Auer, Looking at Art, 1986. "Marriage, to judge by most people's experiences, is hard work. So, come to think of it, is making art. 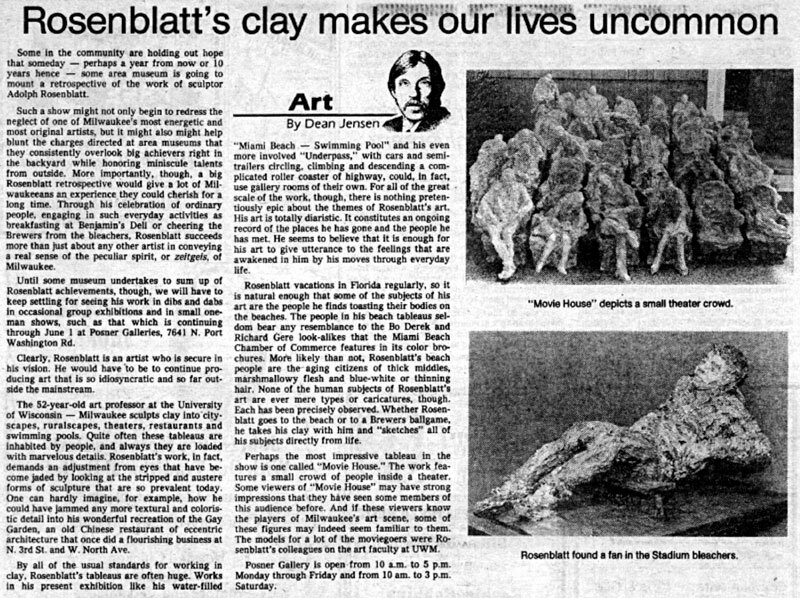 Put the two together and you have a challenge..."
Rosenblatt's clay makes our lives uncommon by Dean Jensen, Milwaukee Sentinel, Friday May 11, 1984. 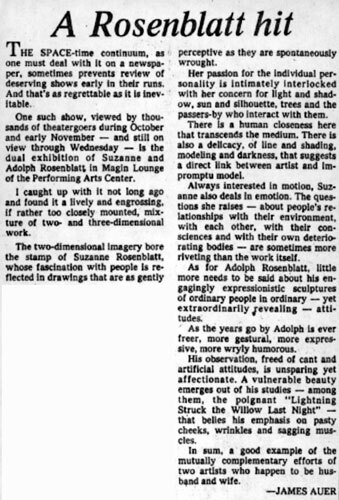 Rosenblatt show joyously loony by Tom Strini, Journal Critic at Large, Milwaukee Journal, Sunday May 13, 1984. 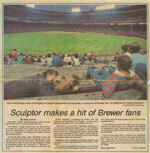 Sculptor makes a hit of Brewer fans by Dean Jensen, Milwaukee Sentinel, Thursday, July 14, 1983. 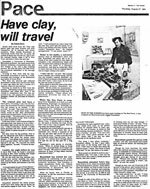 "Clay took shape under the fingers of Adolph Rosenblatt as he made a sculpture of Brewer fan Tim Nehmer at County Stadium." "The raw material may be cheap, but the effect isn't. 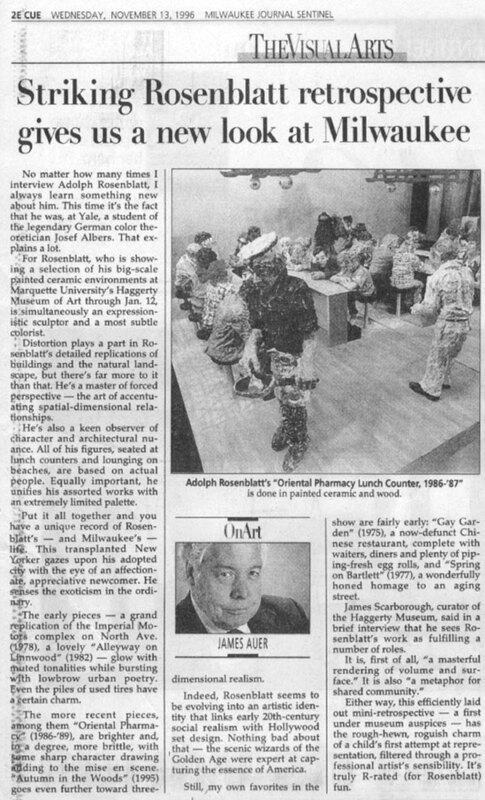 In Adolph Rosenblatt's hands clay becomes a tree-lined East-Side street, the sagging stomach of a Miami-Beach retiree, a dented, canoe-bearing station wagon and a cluster of baseball fans at County Stadium..."
"You see Adolph Rosenblatt's art for the first time and the question you're likely to immediately ask yourself is: What's with this guy?" 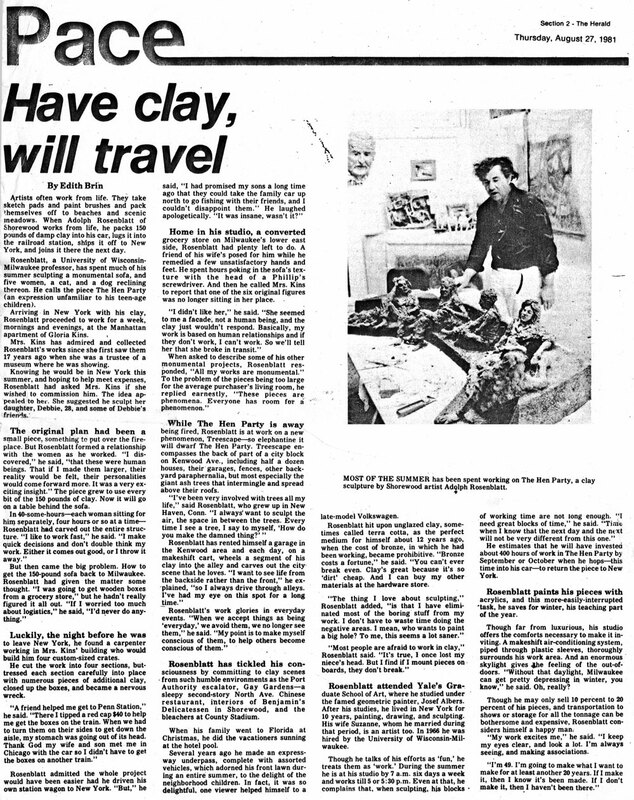 Have clay, will travel by Edith Brin, The Herald, August 27, 1981. "Artists often work from life. They take sketch pads and paint brushes ad pack themselves off to beaches and scenic meadows. 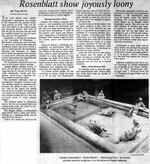 When Adolph Rosenblatt of Shorewood works from life, he packs 150 pounds of damp clay into his car, lust it into the railroad station, ships it off to New York, and joins it there..."
Face of reality: two views by James Auer, Journal Art Editor, The Milwaukee Journal, Sunday, October 14, 1979. 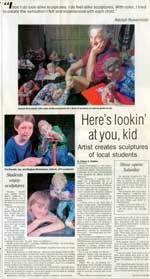 "The face of rality is the stuff of Adolph Rosenblatt's sculpture and Suzanne Rosenblatt's paintings and drawings." A Rosenblatt hit by James Auer. "The space-time continuum, as one must deal with it on a newspaper, sometimes prevents review of deserving shows early in their runs. And that's as regrettable as it is inevitable." 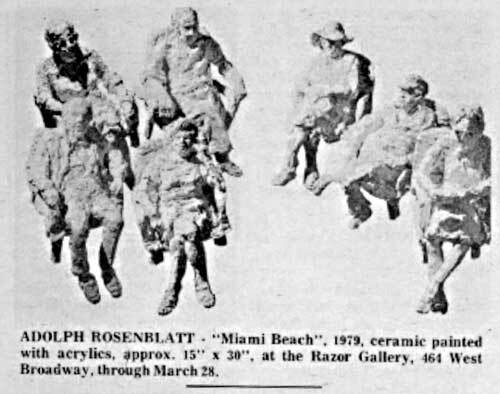 "ADOLPH ROSENBLATT - "Miami Beach" 1979, ceramic painted with acrylics, approx. 15" x 30", at the Razor Gallery, 464 West Broadway, through March 28. 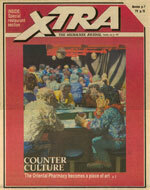 Adolph Rosenblatt at Razor by Robert Berlind in ART IN AMERICA. 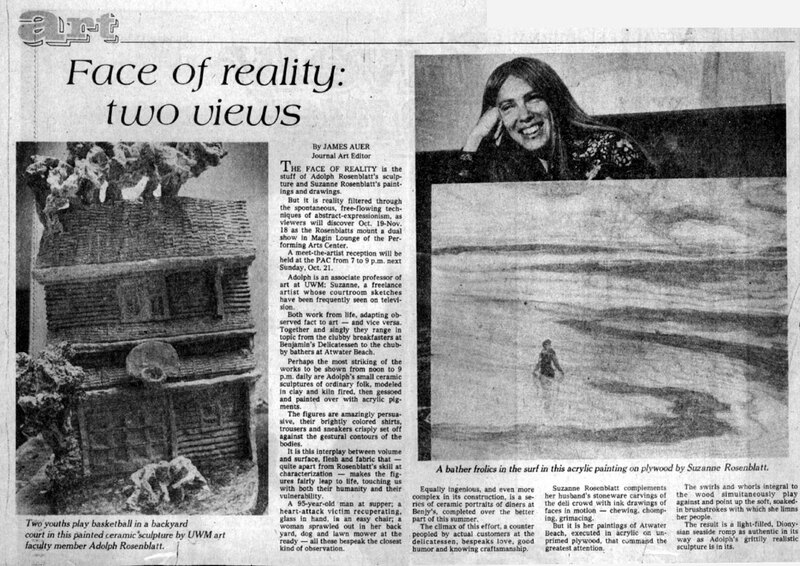 "Although it's been 20 years since Adolph Rosenblatt abandoned painting on flat surfaces for working three-dimensionally with clay, a painterly impulse continues to inhabit his work..."
Front page, The Blade, Toledo, Ohio, Friday, December 15, 1978. "City Scape Ceramics," one-man show at the University of Toledo Student Exhibition Gallery. 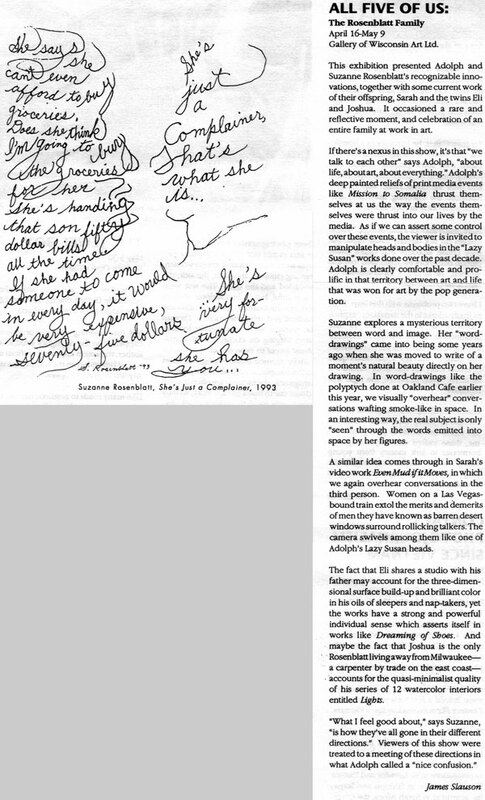 Copyright © 2002 Suzanne Rosenblatt. All rights reserved.